"Just got a call this afternoon stating that my friend, former Kiss guitarist Mark St. John, died this morning from a cerebral hemorrage. He was 51. I have known him for a long time. I roadied for his band White Tiger, and just spoke with him at the recent NAMM show. As soon as I fid out more info I will let you know. My heart goes out to his family. A very sad day. 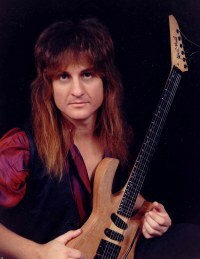 Mark St. John was born Mark Norton, in Hollywood, California, on February 7, 1956 and serves with noteriety as KISS' shortest lived guitarist. During a hectic and disruptive period of two years KISS would change from Ace Frehley to Vinnie Vincent to Mark St. John and then finally to Bruce Kulick, on guitar, with St. John lasting less than eight months. His parents moved to Garden Grove, CA in the early 1960's where Mark was initially more interested in sports than music. In an interview with KISS Strike, Mark recalled, "I played all sports, in fact I played sports before I got into music. Especially basketball, I mean I tried all sports but basketball is what I excelled in. And when I got into High School we started playing CIF with other teams from L.A. and they were all black and I felt that I wasn't a very good basketball player. I mean they just slip and slide all over you, they jump higher and they run faster and you felt belittled after the first five minutes and I gave it up after that" (KISS Strike 46). Growing up in Southern California Mark didn't start playing guitar until he was a sophomore in highschool in 1972 when he also started to grow his hair longer, undoubtedly part of that age-group's rebellion from their parents and society. Initially guitar playing started as a hobby but within a year Mark had become quite serious about it. The techniques and the styles. As to why he started plaing guitar, Mark recalled, "I guess because the guitar was the new thing happening - it was the sound. I'm from a generation that went through a whole different thing in music, like a culture-type thing. It was the voice of the people. It was a source of rebellion and the guitar was one of the biggest things. I remember watching television and seeing the Beatles and the Rolling Stones on the Ed Sullivan show. They didn't have tubas, they had guitars and everyone was going crazy and that put a spark in my mind... The guitar is rock 'n roll. That's what it's all about. From the 50's on, the emphasis was on the guitar sound. Everyone was trying to make the guitar sound like other instruments, but it's not so easy to make other instruments sound like the guitar. The guitar is what's happening" (KISS Force via Otaku). Mark has a brother, Michael (born 1964), who plays bass. The two would be in bands together following Mark's tenure in KISS. They also have one sister (born 1960).